Al Qaeda’s Group for Support of Islam and Muslims (Jama’at Nusrat al-Islam wal-Muslimin, JNIM) attacked a United Nations base in the northern Malian city of Aguelhok earlier today. According to the UN, at least 10 Chadian peacekeepers were killed and 25 others wounded. 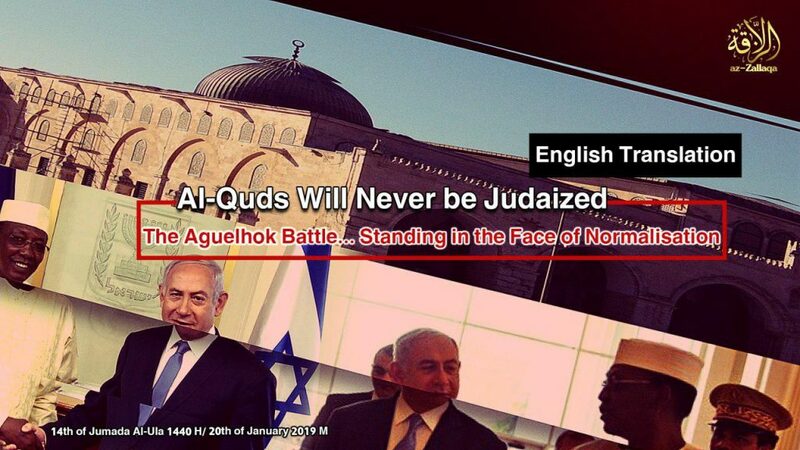 JNIM quickly issued a claim of responsibility, framing the assault as part of a broader al Qaeda campaign intended to prevent the “normalization” of Israel, with Jerusalem as its capital. JNIM’s statement mirrors the language employed by Shabaab, al Qaeda’s branch in East Africa, after its raid on a hotel complex in Nairobi last week. “This attack comes in response to the guidelines of the Command of [Al Qaeda], led by Sheikh Ayman al-Zawahiri (may Allah preserve him), to thwart the normalization schemes woven by the Zionist Arabs and non-Arabs,” JNIM says in its claim of responsibility. Similar to the statement by Shabaab after its attack in Nairobi, JNIM reproduces a quote from Osama bin Laden on the Palestinian cause. “The blood of [your] children is the blood of our children, and your blood is our blood. So, blood for blood, and destruction for destruction. May Allah the Almighty bear witness that we will not let you down until we achieve victory or we taste what Hamza bin Abdul Mutallib tasted,” bin Laden is quoted as saying. JNIM mentions President Trump, who recognized Jerusalem as Israel’s capital, as well as the Saudi monarchy. But much of its claim of responsibility focuses on Chad, which has recently renewed its diplomatic ties with Israel. Prime Minister Benjamin Netanyahu visited Chad earlier today and the two countries reportedly signed cooperation agreements. In reality, JNIM regularly targets UN forces comprised of multiple nationalities. But the group’s latest attack in Mali demonstrates how it considers its actions to be part of al Qaeda’s global jihad. Mossad probably knows where Zawahiri is. His days are numbered.